You didn’t miss the boat because there was no boat. I thought I’d drop a few economic truth-bombs today. People are finding that their own experiences – struggling to keep up with the bills, struggles finding work or enough hours etc. – just don’t marry up with the official statistics. And that’s because those official statistics are still telling a story about Australia going great guns. GDP (how much we produce, aka “the economy”) just keeps on expanding at or above trend (better than average! ), and the unemployment rate remains historically low. The last few weeks I’ve explained how the headline jobs numbers are selling us up the path a bit, particularly masking the harder times facing males and older workers, but this week, lets look at GDP. First up, is the headline number, which is the light blue line in the left panel. As you can see, nothing but golden good times here. Hooray for the good ship Australia! But the truth is that this measure is distorting the picture a bit. The first point is kind of a technical one. GDP is a real measure, in the sense that any shifts in prices are taken out of it. That normally makes sense. If the price of bread doubles but we don’t produce any more, you can’t say that there’s actually been an increase in production. And so the ‘realness’ tries to account for changes in prices over time. The trouble at the moment is the way that it measures mining output. The ‘realness’ is currently stuck at a time when commodity prices were high. So our commodity outputs are having a big impact on GDP. Trouble is that commodity prices have fallen a long, long way. So while we’re producing more, we’re not necessarily ‘earning’ more. And it’s earnings that affect how wealthy we feel. Does that make sense? 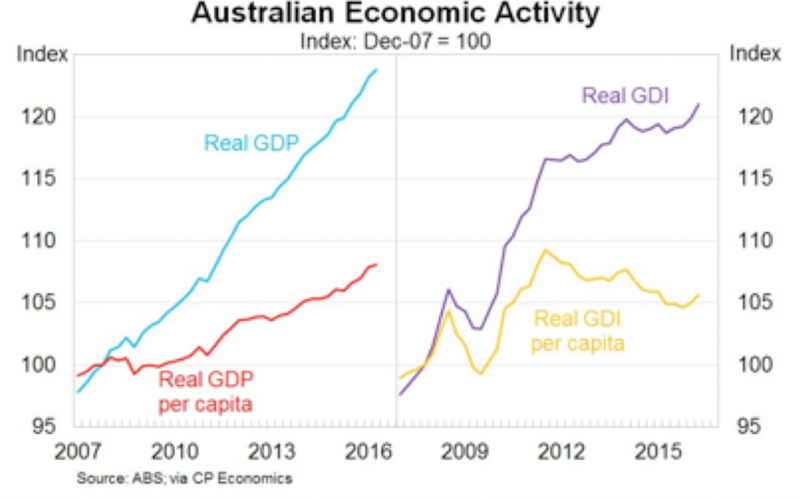 A bit techy, but the unwind of the mining boom, currently means we’re overstating mining’s contribution to GDP. We can get around it a bit by looking at Gross Domestic Income – GDI. Normally GDP and GDI line up pretty closely, but these aren’t normal times. And so if we jump over to the right panel on this graph again, the purple line shows us real GDI. It’s a different story isn’t it? Now, there’s was a growth pause around the GFC, and an actual recession in 2013/14. Make a bit more sense now? But this is just the start of things. Because GDP and GDI measure how wealthy a nation is, but they don’t measure how wealthy its citizens are. To get a feel for that, we can divide GDP by the number of Aussies – to get GDP per capita. Simply put, how much each of us get, on average. This is where it gets interesting. Take a look at the right panel again (adjusting for the mining boom), and this time at the yellow line – GDI per capita. We’re now telling a completely different story. And you get a very different story because the Australian population has been growing exceptionally quickly – largely through immigration. So more people making more things means good headline numbers. But per person, output has been falling. 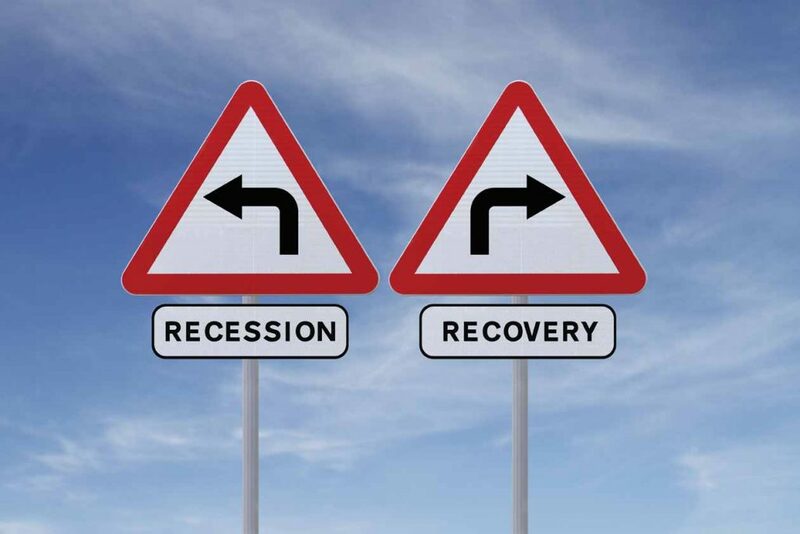 In this story, the end of the mining boom in 2011 and 2012 opened the way for an income DEPRESSION! Output has been on a downward run since then, and is still around 5% lower than it was 4 years ago! Now does it make sense? This is why wages are growing at record lows and falling in some sectors. This is why people are doing it tough. This is why it feels like you’re struggling to get ahead even though the government is telling you it’s the best of times. On a per capita basis – at the individual level and the only level that really matters – these last four years have been tough. Really tough. So if you’ve been battling these last few years, you’re not alone. You’re not the only one living outside the golden economic dream. Because that dream was just a fantasy. And most of all, it’s not your fault. You didn’t miss the boat because there was no boat. Now I don’t think the statistics were deliberately set up to deceive, but I do think we need to recognise that these haven’t been easy years for a whole lot of people. Once we face up to that truth, we can start doing something about it. Anyone else feel like they’ve been living through an “income depression”?